Simsalabim is a popular online Video Slot from Net Entertainment, and the game follows the life of a Stage Magician, who – with your help – will use his magical abilities to summon wins, and (hopefully) add money to your online casino balance. A beautifully-designed game, the traditional Net Entertainment layout is seen clearly, with 5 reels, and 25 paylines present; the pay lines are fixed, so you won’t be able to change how many you play. The minimum spin starts at just 25p, with £250 being the maximum spin amount. Unfortunately, as is the case with most of Net Entertainment’s games at the moment, the low-paying symbols are depicted using playing card values. However, the game specific symbols are much more in-line with the high-quality design of the game, and include a Bird Cage, a Houdini-Era Suitcase, a Magician’s Hat, and a Magic Wand. There’s also some special symbols to keep an eye out for, including the scatter symbols, the Wild (which is depicted as a Hypnotist), and a Magical Cube; more on that later on. The audio and graphical work is really high-quality, and Simsalabim is available to enjoy on desktop, mobile, and tablet devices, ensuring all players can take advantage of the game’s “fun-factor”. One thing to note, is that if you do choose to play from a mobile device, you’ll want to ensure you’re playing with a reliable Internet Connection, to avoid the game dropping-out on your mid-spin. To trigger the free-spins, you’ll need to land 3, 4, or 5 of the scatter symbols anywhere in view on the reels. Landing three, awards you with 10 free-spins, while 4 or 5 scatter symbols awards you with 20, and 30 free-spins respectively. 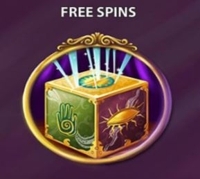 The free-spins round sees all your wins multiplied by 3X, and it’s possible to re-trigger more spins, by landing another 3 top 5 scatter symbols. This is generally the bonus-round you’ll want to aim for, and to trigger it, you’ll need to land three or more of the bonus symbols in view. (The bonus symbols appear as Magic Bunny Rabbits). 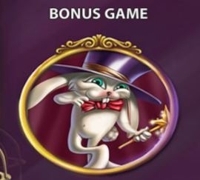 Once you have triggered the bonus-round, you’ll be taken to a new screen, where you’ll see 12 Magic Top Hats; your mouse cursor appears within the game as a hand controlling a wand, and you simply pick from the 12 hats, to win cash prizes. You continue to pick until a hat reveals no cash prize, at which point the bonus ends, and you’ll be taken back to the regular base-game. While neither the free-spins or bonus-round contain any particularly exciting ‘extra element’, they’re both easy to trigger, and can quite easily pay in the region of 20-70X, so while you’ll be waiting a while to hit big 500X wins, Simsalabim is perfect for recreational players looking for a relaxing, and low-variance gaming experience.